We take our freedoms for granted, but there are some things very important to fight for. Our right to express ourselves is one of these. 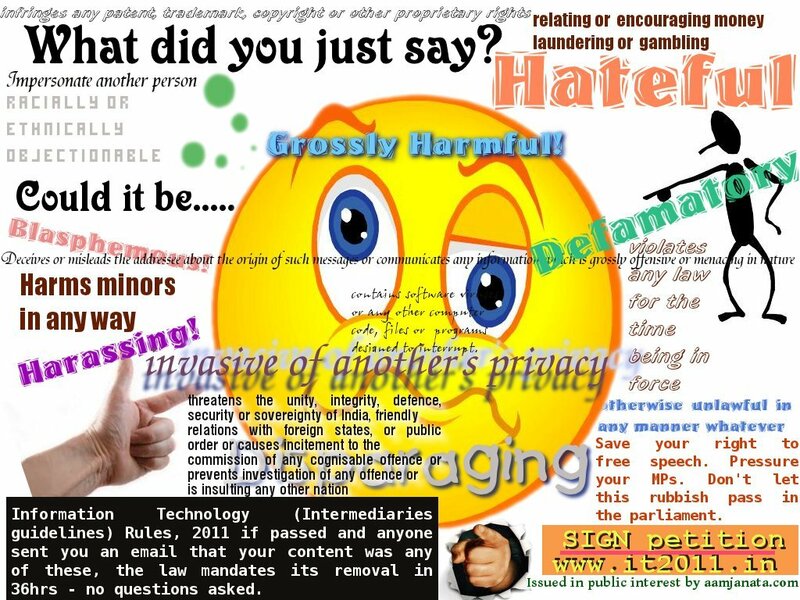 The proposed IT rules by pass the courts or any evaluation mechanism between a complaint and taking it down. In essence, if I dislike you, I could notify you that your content violated these rules, and you would be required BY LAW to take it down. And how easy or difficult would it be to find violations? Fairly easy. Free Speech is the fundamental nutrient of a democracy. Kill that, we are not a democracy. No one enforces these rules, because they are too bizarre. But if I want to attack you, all I need is a list of your best blog posts. If there are wars of censorship between two adversaries, inevitably it is going to boil down to who can burn more buses in real life. We already have laws to remove dangerous content. Bypassing courts or any form of judicial oversight is only laying the foundations of dictatorial silencing. In other words, we don’t need these rules. At all. We already have too much framework to support censorship and silence citizens at will. If it doesn’t seem so, that is because it is rarely used to administrate and is used more as a threat. 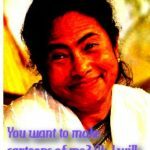 Witness Mamata Banerjee and the cartooning professor. We don’t need this kind of blanket control over our own right to speak. This rule does not state a single kind of content or condition that would not need removal. In other words, it treats everyone as guilty unless proved, and there is no opportunity for proof. Here’s what you do. Write letters to as many MPs as you can, making it clear that you see these rules as unconstitutional and repressive of human rights. As your MPs to refuse these rules. Keep speaking of this on and off in social media and real life. Make people aware. Ask them to join in. Think up spoofy ideas on what we can do to advertize our thoughts in creative and inviting ways. The comments are yours. Hoping for some brilliant ideas as well. Will add suggestions here. Do not drop this catch, if these rules pass, even writing openly about them will forever carry risk of the government killing your thoughts before they reach people. do you have a link where one can read the official version of the Act?